Confirmed! Manny Pacquiao vs. Timothy Bradley Rematch on April 12 - Balita Boss! It is confirmed, Manny Pacquiao will return to the ring as he faces Timothy Bradley on April 12 (April 13 in the Philippines) in a rematch of their controversial 2012 welterweight title bout. Bradley vs. Pacquiao 2 will take place at the MGM Grand Garden Arena in Las Vegas, Nevada. Promoted by Top Rank, in association with MP Promotions and Tecate, the confirmed rematch will be produced and distributed live by HBO Pay-Per-View. The undefeated two-division world champion Timothy Bradly will defend his World Boxing Organization welterweight title against Filipino boxing superstar Manny Pacquiao. 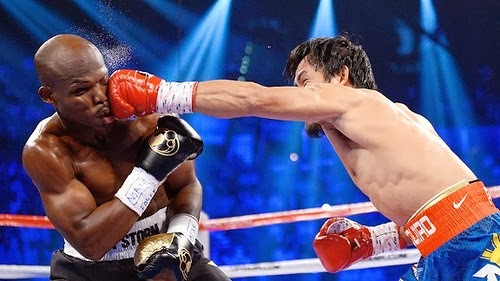 In their first meeting on June 8, 2012, in Las Vegas, Bradley was awarded a 12-roung split decision victory and Pacquiao’s WBO welterweight belt despite most observers felt that Pacquiao had won the bout. Since that fight, Bradley with a record of 31-0 with 12 knockouts, went on to win two more fights against Ruslan Provodnikov and Juan Manuel Marquez. Pacquiao will come into this rematch with a record of 55-5-2 with 38 knockouts. After the controversial lost to Bradley, he was knocked out by his biggest rival Juan Manuel Marquez in December 2012. Pacquiao made a successful comeback in November 23, where he won a unanimous decision over former world champion Brandon Rios in China. Ticket information and other details on the promotion and the media tour will be released shortly, Top Rank said. Many fans wanted to see Manny Pacquiao avenge his loss to Bradley. Timothy Bradley is out to prove that the first fight wasn’t a fluke but a well-earned decision. Who do you think will win the Pacquiao vs. Bradley rematch?